76% of marketers say they don't have enough information at the start of a project. Data should guide every action you take as a marketer and it's all around us, but this is both a good and bad thing. Good, because we need it, but bad because it can be overwhelming and hard to know where and how to start using it. This can lead to a dysfunctional marketing team—but it doesn’t have to be this way. Data-Driven Design (3D) is an actionable, evidence-based framework that improves the performance and collaboration of marketing teams of all shapes and sizes, just like yours. It makes it easier to access the data that really matters, so your team can focus on creating high-performance digital experiences that solve real, observed customer pains. 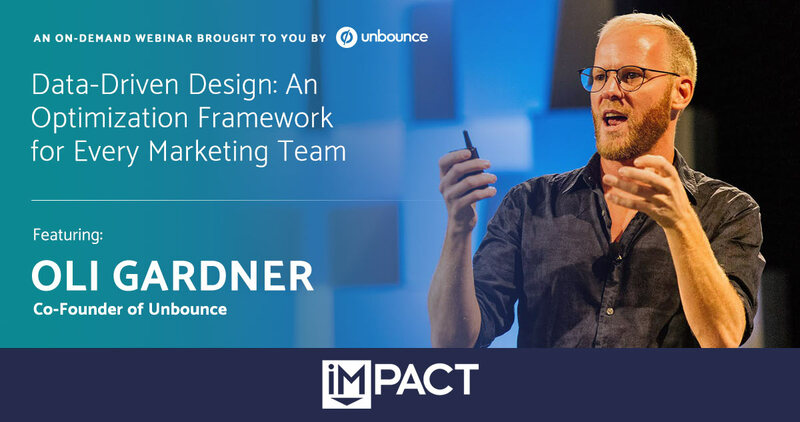 Oli Gardner, Unbounce Co-founder and renowned international speaker, is the foremost authority on using data-informed tactics to create a more delightful experience for marketers and customers alike. How to use The 3D Playbook to narrow hundreds of sources of overwhelming data into what you actually need. How to run multiple experiments to fuel your next project. Why conversion rates are dead, and why you should use micro-metrics instead. A collaborative process for marketing teams that creates empathy not only for your visitors and customers but for the people you work with every day. Whether you're a marketing agency or a small B2C or B2B business, you walk away with an actionable framework to help improve not only your website experience but your teamwork and productivity as a whole! Unbounce co-founder Oli Gardner has seen more landing pages than anyone on the planet. He’s obsessed with identifying and reversing bad marketing practices, and his disdain for marketers who send campaign traffic to their homepage is legendary, resulting in landing page rants that can peel paint off an unpainted wall. Once you fill out the form, you’ll receive an email with the webinar recording and slidedeck.